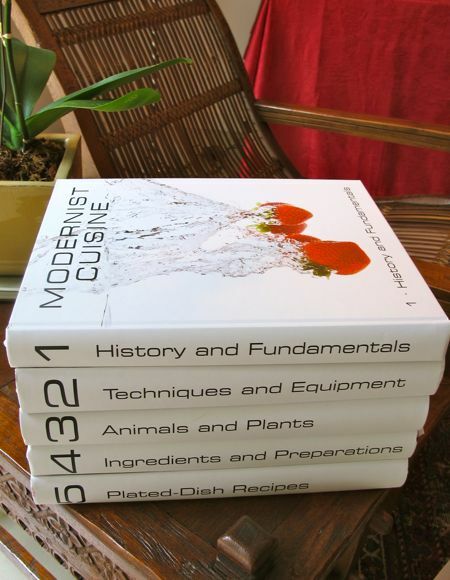 The six-volume, 2,438 page and 40 pound “Modernist Cuisine, The Art & Science of Cooking” was under the tree on Christmas Day. Santa and his reindeer were probably muttering under their breath as they hauled this weighty set of books from their nearest invisible gift warehouse. 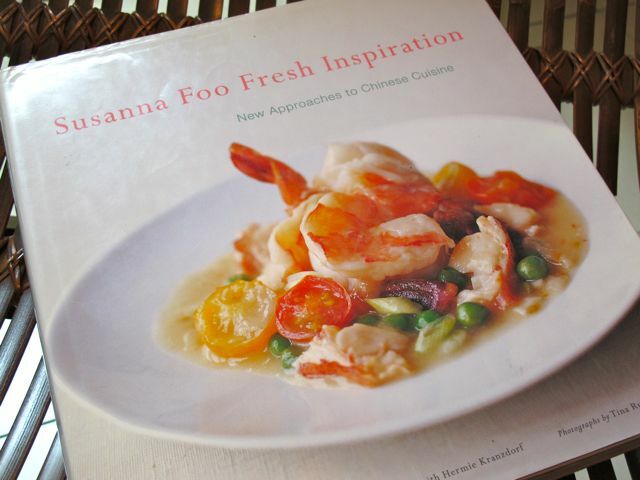 :) The ultimate foodie publication for 2011, and perhaps for another decade after that, it is a stunning and impressive collection of recipes, photographs, technical descriptions, etc. I am not sure I will be able to try any of the sous-vide or other concoctions, but I can tell you it will make great leisurely reading for at least the next year or so. Read more about it in a New York Time review, here. The stack by the reading chair isn’t all Christmas loot, rather acquired over the past few months, gifts from friends and family, etc. 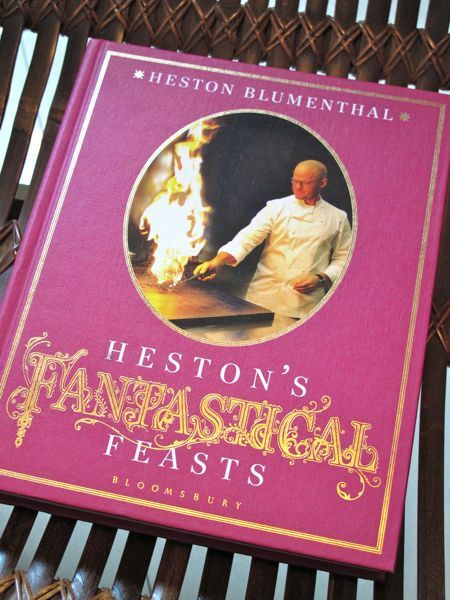 First up, a fantastic find at a Booksale second hand store, this book on Heston Blumenthal’s Fantastical Feasts. At roughly PHP300 or so, it was an absolute bargain. 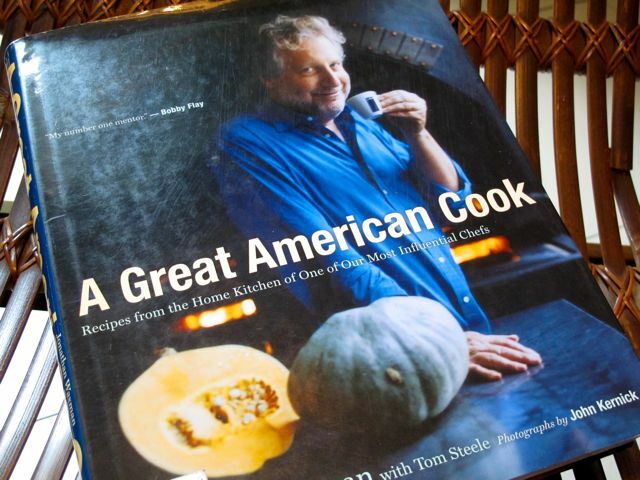 The book equivalent to his terrific television series on several amazing feasts he prepared several years ago. A great find. 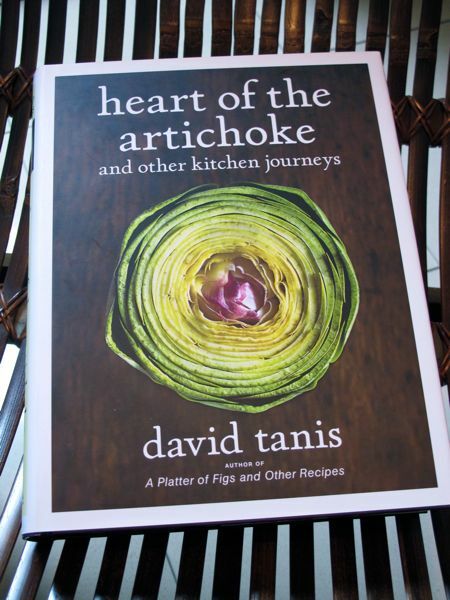 His second book, “Heart of the Artichoke” continues with the seasonal menu theme, and I think one of my New Year’s resolutions must be to try at least a couple of his menus over the course of 2012! 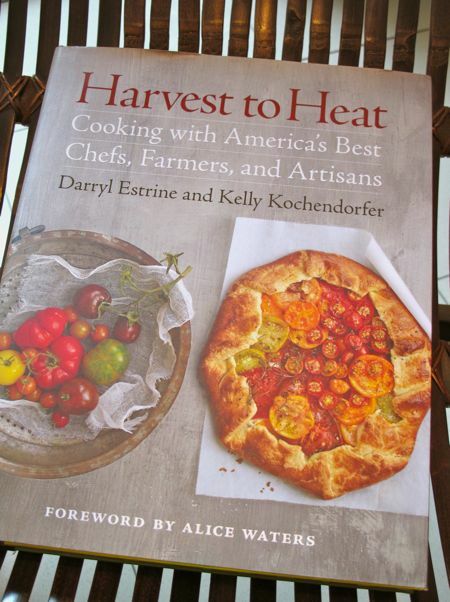 “Harvest to Heat” is another book that received glowing reviews, and while I have only glanced through it briefly thus far, I think the accolades are probably deserved. 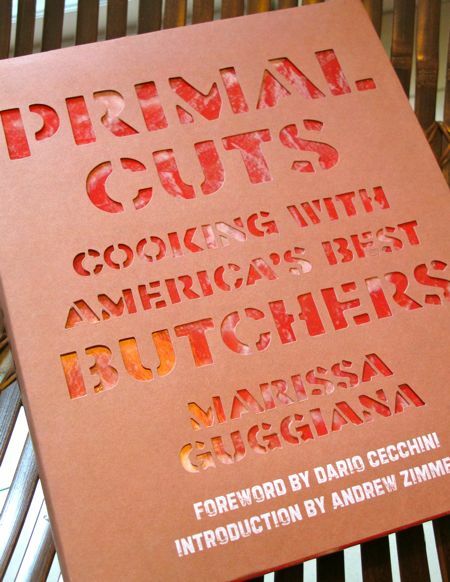 Again focusing on the ingredients, closest to source and prepared simply, this is a great compilation of recipes and insights from over 100 chefs and food artisians across America. 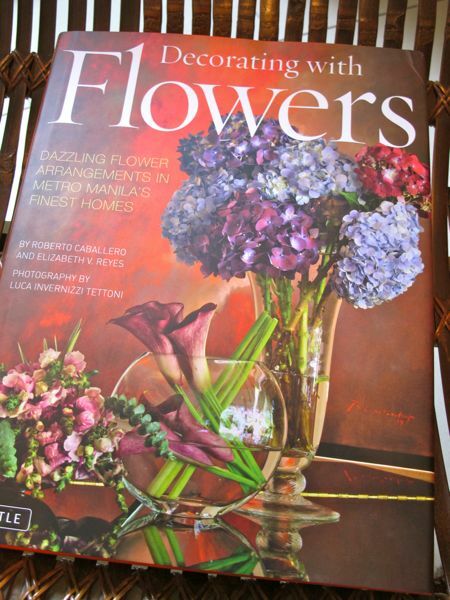 Not a cookbook at all, this book on decorating with flowers is a brand new publication by Tuttle, authored by Roberto Caballero and Elizabeth Reyes. A Christmas gift from my college roommate and his wife, and dinner guests at our home for the past 25 years, it is an interesting look at some of Manila’s chicest homes and the floral arrangements they have while entertaining. 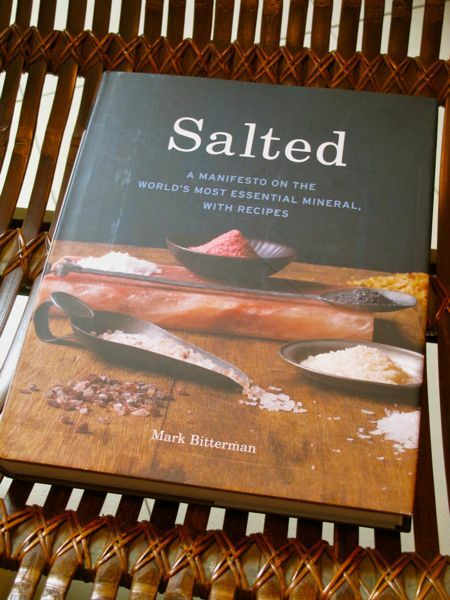 I had intended to visit Mark Bitterman’s shop called “The Meadow” in New York on our last trip, but didn’t get around to it, so I thought I would pick up his book on salt instead. It seems like a stretch to write a 300+ page book on a single ingredient, particularly one as “straightforward” as salt, but let’s see… haven’t even flipped through this one yet. 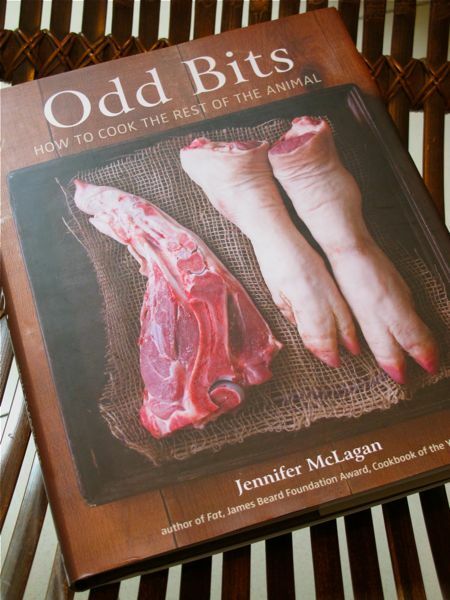 Jennifer McLagan’s “Odd Bits” is something I have wanted to purchase for several months. I really like the concept of trying to find ways to use up the entire animal (mostly pigs due to our Zubuchon adventure) and am now much more willing to experiment with dishes made up of less prime parts of every animal. I have the author’s other book on “Fat” and it is one of favorites, so I expect good things from this one as well. 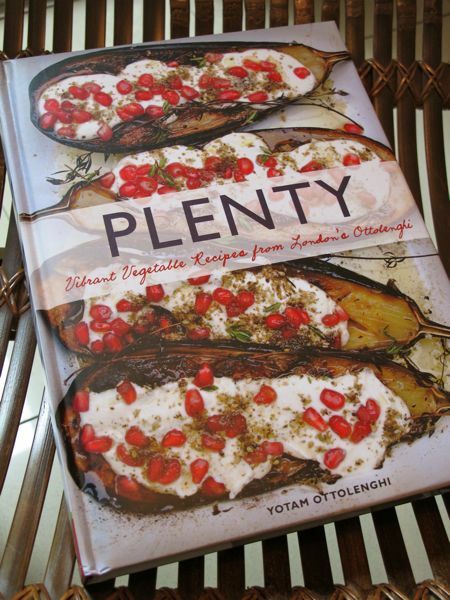 I also picked up Yotam Ottolenghi’s new, visually arresting book, “Plenty” with over 100+ vegetarian recipes that look stunning and hopefully taste amazing. I have his other book and both are off-shoots from the eponymous take out food shops they have in London, and a column he wrote for The Guardian newspaper. 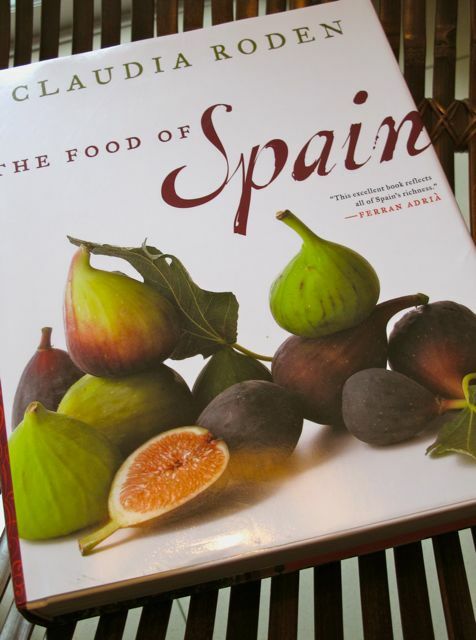 Claudia Roden’s cookbook “The Food of Spain” seemed like another good addition to the bookshelves. She has authored several other cookbooks on a rather varied number of cuisines, and we have her book “Arabesque” on the shelves, so I was interested to see her views on Spanish food — not just recipes but history, etc. 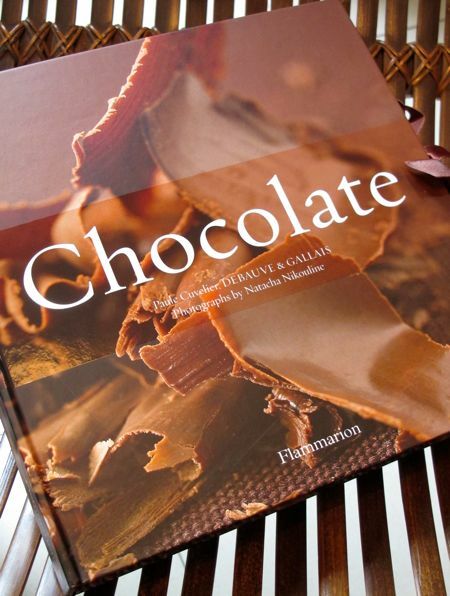 Another Christmas gift from good friends, this book on chocolate explores its history and the wide variety of this luscious treat. 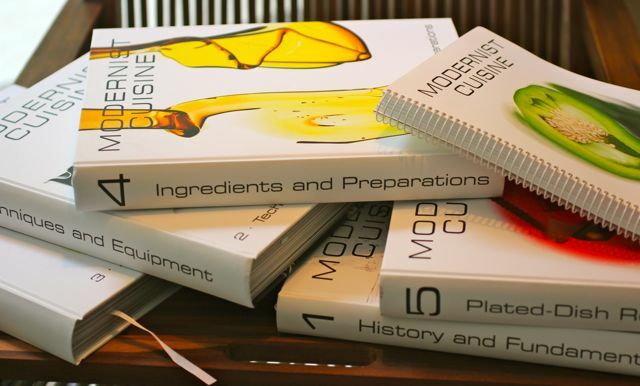 Is there any way I can browse the “Modernist Cuisine” books? Just like you, I dont think I can replicate the recipes there, but it intrigues me a lot, specially the science behind it. Fully Booked sells it at a prohibitively high price. ariel, the set in the US is listed at USD600+ but at Amazon it is discounted to roughly USD450 or PHP19000+. It is a lot of money. But if you pulled back from three fancy meals over say a one year period and traded it for the set, it would be worth it, in my opinion. If Fully Booked has them on their shelves, you should be able to browse through them. Even if wrapped, I always open and look through them before buying. The Modernist series looks interesting. Looking forward to the coming months ahead…..I’m sure you will be sharing with us recipes and bits of info from your readings. I could imagine you flipping through these books then rushing to FTI for the ingredients. =D Looking forward to posts about dishes/full meals cooked from these books! I watched one of the videos they had where they cooked the “perfect” burger. I remember certain parts involving sous-vide and something involving liquid nitrogen. I assume every recipe in the book requires techniques in molecular gastronomy? I’m also a huge fan of Booksale having scored numerous coffee table books, travel guides and back issue magazines from there at very cheap prices. I usually make a beeline for the interior design section. Which branches do you go to? Marketman, I realize you already have a lot on your plate as it is but I can certainly recommend ‘Secret Ingredients: The New Yorker Book of Food and Drink’. 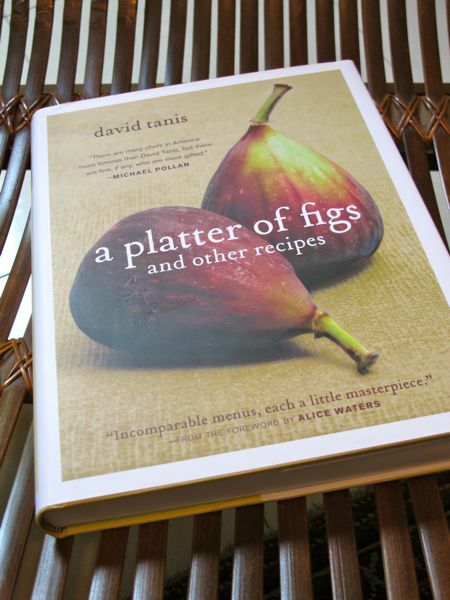 Not a cookbook but rather a collection of beautiful essays about food and culinary adventures—a wonderful diversion. There is plenty to chuckle about and, uh, ruminate in its pages. Happy reading! Hi MM! Like you, I love cookbooks and I have a small collection of vintage cookbooks from the early 70’s. I love browsing through Book Sale where I get most of them at really low prices. I don’t know what it is I love about them but it just brings me to a happy place when I read them. Enjoy your cookbooks! i love booksale and have found many treasures there. as for the MM cookbook, we’re all holding our collective breaths for the announcement of the launching date! LUCKY YOU!!! i am so envious at those books!!! you have to do alot of reading , cooking and posting . we will be here waiting. HAPPY NEW YEAR MM!!!! Wow, that Modernist Cuisine is a very special, generous gift! Delicious reading all, MM! Love, love just to even flip through books, ano pa kaya, those on cooking and travel!! Happy reading!! especially since you share your finds with us. Thank you. Happy new year! Nice to know that Jennifer McLagan’s books made the list. Her first book, Fat, is also one of my and the hubby’s favourites. We were fortunate to have met her at a book signing here in Toronto. Great stuff. This post makes me miss Booksale though. I have always come away with great finds whenever I go back to Manila…. Amazing collection, i too wanted to have a huge library of cooking and baking books. This is a very touching subject because i lost my collection during the Ondoy flood and is now in the process of starting over. I thought of writing you and you alone because i hope you can like me make an honest review of this baking book i recently purchased and is now whirling and cringing in utter despair. I am talking about the Goldilock’s Bakebook, priced at a cheap P795.00, i grabbed it in a wink but is now bitterly sorry for having bought it. Please find time to try the recipes and let us know what you think. I am fond of baking and cooking from recipes i get over the internet and cookbooks, never have i been this disappointed. I just have no idea why they would write such an inconsistent disproportionate book. The leche flan alone has 1 1/2 cups of sugar for only 4 eggs, 2 yolks and 1 cup of evap. The leche flan was spongy, cloyingly sweet and inedible to our standards. What a waste. I was suppose to bring this book to New York with me, now i am leaving it in the shelves, way down the corner edge of the bookend. Thank you and congratulations for a pretty nice website. Happy new Year market Man! I am so glad you were able to buy the much coveted Modernist Cuisine set. It is truly a set worth having for serious foodies like yourself. Good luck on your reading spree! Hi MM, it’s a bit off topic but I just learned about this new website http://taxikick.com/ where we can report abusive taxi drivers and I remembered your post about it before. I’m considering tackling a sous-vide steak or fish recipe (but using a low cost alternative option – beer cooler!). There’s also several websites here in China that sell all the modernist cuisine/molecular gastronomy gadgets and ingredients, pricey but available! May the books be enthralling and engrossing! I also love the fact that some of your books came from Booksale, high five fellow Booksale lover! plenty is a lovely book… I did the potato pie with goat cheese! I will eat at his place when I come back next month! I’m in London right now ? they’re all very good reading material, i’m sure. i remember thinking you were publishing your very own … when — is up to you, of course. but if and when you do, we’ll all stand in line for it! and hopefully, mine is autographed. lucky you. I have been wanting that six-volume set but alas, Santa apparently didn’t get my letter – or wasn’t listening when I was rambling. Have also been curious about the Ottolenghi cookbook. New Year , time to eat more vegetables. re goldilocks cookbook: i thought it was good because heny sison wrote about it in one of her columns. 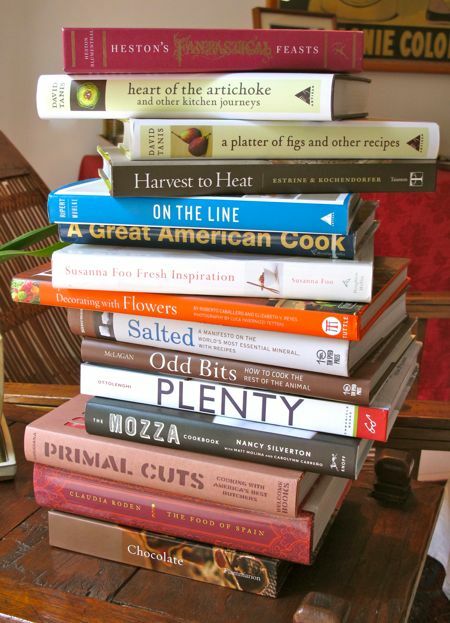 These books were the prize for the Top Chef winner in last night’s segment. The author was one of the judges. Just wanted to pipe in and say that I just finished watching the same Top Chef episode that esubijano mentioned. 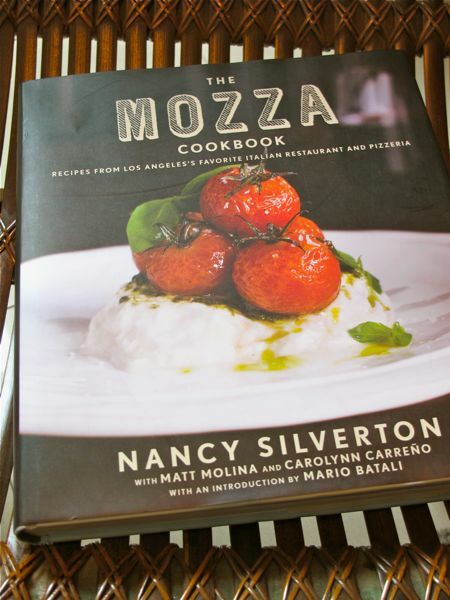 A lot of the chef authors in MM’s impressive book list have also been guest contestants and judges in past Top Chef (and Top Chef Masters) seasons. $450-$600 for that set of books seems rather steep unless you really do eat, live, breathe cooking. It would be like owning the some great 5 volume set of piano sheet music but only being able to play “chopsticks”. Yep, if there’s anybody I know in this world who is most likely to get this behemoth set as a gift, it would be you. As to your own, the majority of fellow Market Manila fans will probably execrate me for this but I read just very recently that it is a lot less troublesome to write and publish a cookbook than to sell it. Wow, MM. What a collection. I am sure Booksale will get more customers after reading this post. : ) MM, I think it’s time you come out with your own cookbook, but please do it like how you do your blog, which focuses not just on recipes, but mostly on proper techniques and fresh ingredients. My main complaint about our cookbooks is that they focus too much on recipes instead of using the recipes to illustrate to people how to use a cooking technique or ingredient. I am so sure that if done this way, your cookbook will be a big hit. Footloose, I agree with you. Like almost everything, easier to make than to sell. Then again, we can never know what the market wants. In the end, it’s always the customers who position the product. I do think that MM’s cookbook will sell well as long as it’s distributed properly just because there is a need for such a cookbook. Holy smokes! You have the Modernist Cuisine! 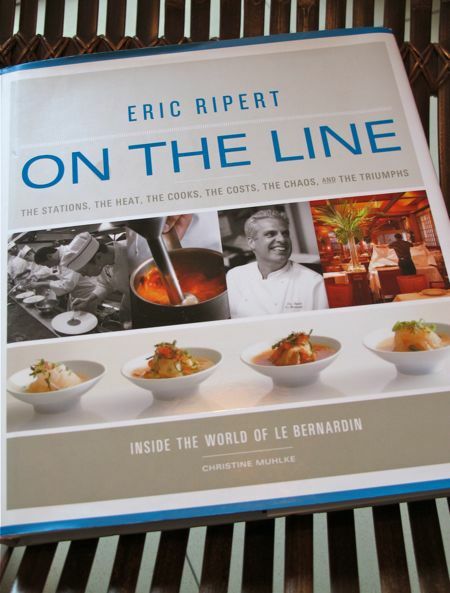 It’s like the new-age encyclopedia for chefs and cooking enthusiasts! Looking at the pictures alone is magical. A very generous gift indeed! The Unbearable Lightness of Being (on a Bloody Diet)!! !